Q. How long does it take before delivery and installation after I have ordered my system? A. Anywhere from one to three business days. If we have your system in stock(we normally do) we typically will perform the install the next business day. In some cases where equipment must be ordered, it may take up to three business days before we can perform the installation. Each of our treatment systems are custom built and delivery time may vary based on the individual requirement of the system. Q. How do you handle warranty issues and what is the warranty on your water softeners and iron filters? A. We offer a 1 –year “No questions asked” warranty on parts and labor. We will come out to inspect your equipment, reset your timer, or replace defective equipment at any time during the first year. Additionally, all valve bodies have a 5 year manufacturer’s warranty, and tanks have a 10 year manufacturer’s warranty. Other “National Brand” companies advertise a Lifetime warranty, however, there is a significant amount of fine print associated with such warranties. They tell you at the beginning that it comes with a lifetime warranty, but what they don't tell you is that the warranty only covers certain parts that hardly ever go bad and the others are pro rated for 5 years and you pay 10% 1st year 20% 2nd year and so forth until the 5th year which is @ 50% of the replacement parts. Q. Are your systems metered, on demand, water flow only or do they regenerate by days only? A. We carry both metered on-demand systems, and timer based systems. Each works well in its appropriate application. The metered on demand, water flow systems regenerate based on gallons used only so if you have more or less people in the home they will keep up with the usage if you go on vacation they will not regenerate because no water is being used. We also carry Timer based systems that regenerate based on a preset number of days. Call us to discuss your specific issues and we will be able to determine which system best serves your needs. Q. Can I use Potassium Chloride instead of salt with your Water Softeners? A. Yes. This is typically a good option for customers who are on a sodium restricted diet. Q. What about flow rates, should I worry about water flow through these water softeners? A. We always think about flow rates. The important thing to remember is that all of our systems are custom built and designed to fit your home. This custom design is based on a number of factors to include square footage, number of inhabitants, plumbing size, and other water demands a particular customer may have. Water treatment is not a “One size fits All” industry, and your system must be correctly sized. Q. How much purified water will my reverse osmosis unit produce? A. 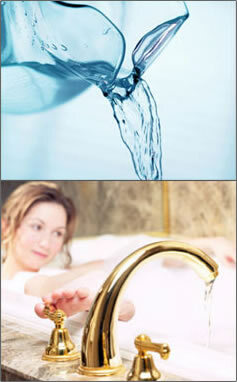 Our household reverse osmosis systems is a 5-stage system that can produce 50 gallons a day. Q. How “pure” is the water from a reverse osmosis system? A. Reverse osmosis will remove 90% of total dissolved solids from water, giving you bottled water quality at your sink or outlet of your choice. Q. What is the appropriate use of an Ultra Violet system? A. Ultra Violet is a safe, clean, easy to maintain method of assuring that water is free of active bacteria. It is a proven technology that has no significant drawbacks. In some applications, its initial cost is a bit more than chlorination, but because of its low operating cost, it quickly pays for itself. It is essentially trouble-free. Most systems require only an annual change of lamp, like changing a light bulb. Q. Will UV change the taste or smell of my water? A. UV is a physical disinfection process, no additives are required. It does not change the taste or odor of the water. It simply provides safe reliable disinfection. Q. Do I need to Disinfect My Municipal Water Supply? A. Municipal water supplies are required to meet State standards and nothing more. You may wish to give yourself that added “peace of mind” and install a UV sterilizer to protect against the possibility of drinking or using contaminated water. Q. I have red-brown staining in my home, what is causing this? A. An iron problem is characterized by the red-brown staining of bathroom fixtures and laundry. In well water, iron usually occurs in its ferrous state. The water is clear when drawn but once exposed to air the iron changes into a ferric (oxidized) state. The water turns red and forms insoluble “rust” particles. Staining can be caused by as little as 0.3 milligrams per liter (mg/L). When staining becomes visible you need to consider an Iron Removal System. Our iron removal system is made with a backwashable system using a specific iron removal media. Q. I have blue-green staining in my home, what is causing this? A. Acid water. Acidic water means your water has a pH balance of less than 7.0 and will actually eat away at your plumbing, as well as deteriorating copper pipe = blue and green staining and galvanized pipe causing red staining from iron leaching out of pipes. This problem is solved by using a pH neutralizing system, which will raise the pH level and turn your water from acidic to alkaline saving your homes expensive plumbing in the process. Our neutralizing system is made with a backwash control valve using two neutralizing media’s. By using a backwashable valve you will not only get the acid problem corrected but will also gain the advantage of a filtration system. Q. I have a rotten egg odor in my water, what is it? A. Hydrogen sulfide gas (H2S) can occur naturally in any water well, and gives the water a characteristic "rotten egg" taste or odor. We remove hydrogen sulfide gas with a two-phase process. First we install a chlorine injection system which will eliminate the sulfur bacteria and oxidize the sulfur into a filterable state. Secondly we filter that water through a backwashable system to remove the H2S. Q. What is Chlorine Injection? A. The system injects liquid chlorine directly into your water supply to resolve bacterial contamination problems and to oxidize harmful elements found in water such as iron, manganese, and hydrogen sulfide gas . We use a peristaltic chemical feed pump and a 15 gallon solution storage tank. The pump is connected to the injector and pumps a small amount of chlorine into the water supply each time your well pump turns on. Either standard household bleach or the more concentrated commercially available liquid chlorine solution can be used as your chemical feed. You may want to reduce the chlorine from your water that is added by this process by adding an automatic backwashing filter to your design. Q. Do I have to add the resin to my softener? A. No, we supply you with the appropriate amount of resin. Our 8% cross link resin should last 12 to 15 years unless there are high amounts of Iron and Chlorine, which will reduce the life span of the resin. If you have high Iron or Chlorine levels you will need to consider an independent filtration system to be placed in front of your softener. Q. Can I replace the resin once it goes bad? A. Yes you can. However, we can replace the resin and give your system a thorough inspection to determine if there any other maintenance issues that may need to be addressed.